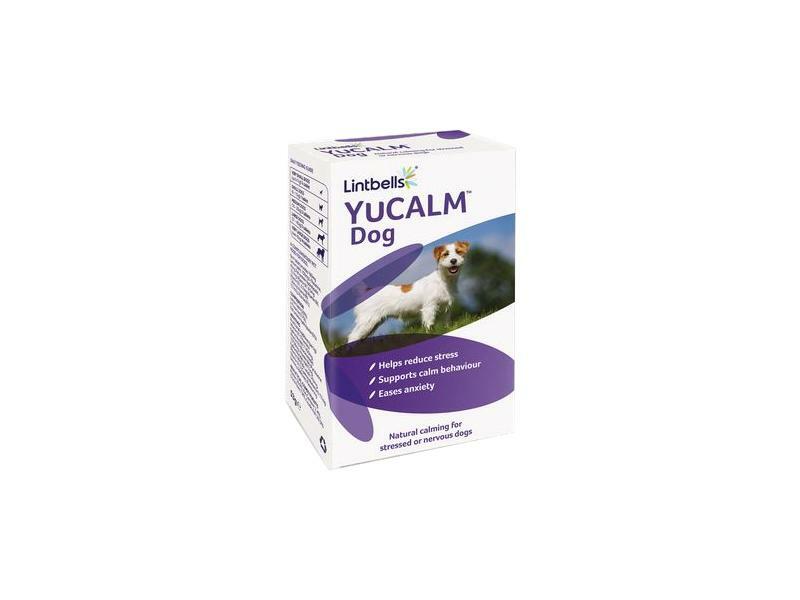 YuCALM Dog’s natural, scientifically proven ingredients help your dog cope with stress. It’s ideal for pets who are fearful of fireworks, other dogs, strangers, and other triggers. Lemon Balm works on GABA levels to make your dog feel more relaxed, soothing stress and encouraging calm behaviour. L-Theanine offers natural calming properties that support the production of calming compounds such as serotonin. It also supports the production of dopamine to maintain levels of hormones responsible for happiness. B vitamins support healthy nerves and brain function, reducing excitability and improving concentration. Our special blend of natural fish protein hydrolysate supports your dog’s brain, helping calming signals find the right spot. It also supports GABA and dopamine levels for a ‘feel good’ effect. Lemon Balm, L-Theanine, Fish protein hydrolysate, B vitamins. We understand that every dog is different and because of this results may vary. Although you may see results after a few days, we recommend using YuCALM Dog from 3 to 6 weeks to see the full benefit. Below are some recent questions we've received regarding YuCALM Dog, including answers from our team. My dog is currently taking nicinamide and omega 3 supplements as well as another supplement for hair and nails, due to the fact he has SLO. What are the amounts of each ingredient in each Yucalm tablet? I don’t want to exceed doses of things he is already getting. Yucalm is a very safe supplement and should not react adversely with the vetmedin so it is fine to give both together. what ingredients does yucalm contain ? does it contain evening primrose oil ? If you are looking for something containing evening primrose oil then you could try Dorwest Evening Primrose Oil capsules. Our dog is very nervous about any noise, we bought this product from the vet but they were not sure how many to have or how long to take them for! Can you please help, our box contains 30 tablets, our dog Stan is a small JR average 5kg. Stan would need 1/2 a tablet daily. The tablets can be taken daily longterm so you can use them for as long as you need to. If your dog is very nervous they may or may not have the complete effect you are looking for. It would also be worth seeking advice from a behaviourist- there are some helpful tips on www.apbc.org.uk. I would aim to start giving the tablets for 5-7 days before new years eve. Building your dog a den where he feels safe and secure can help dogs afraid of fireworks. It helps to muffle loud noises and flashing lights.